On the occasion of the 39th United Nations Human Rights Council, Euromed Feminist Initiative (EFI) and Palestinian Working Women Society for Development (PWWSD) met with decision makers and stakeholder to denounce the escalation of violence and the growing of the apartheid system in Palestine. On the 24th of September 2018, the Independent Commission of Inquiry on the Occupied Palestinian Territory presented its report to the Human Rights Council in Geneva, Switzerland. EFI and PWWSD took this opportunity to organise a three days lobby trip to inform about the opened practices of apartheid against the Palestinian people and the ongoing violence faced by women and girls. The delegation met with several UN bodies and international organisations to build cooperation and asked for concrete actions to end the culture of impunity and hold Israeli accountable for its violations and crimes. The delegation also raised the issue of the annulment by EU of the enhanced status with Israeli in respect of article 2 of the European Neighbourhood policies regulations not to agree on enhanced status with any Southern Neighbour State where human rights are violated. To know more about EFI’s position, read here our statement for Justice for the Palestinian people published on May 2018. 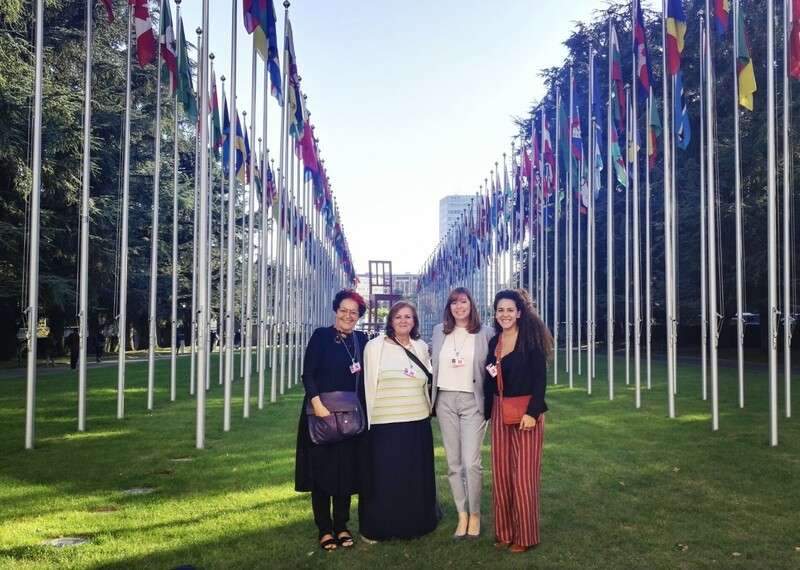 (From left to right) Lilian Halls-French (Co-President of EFI), Amal Kreishe (General Director of PWWSD), Hélène Dworak (Program Officer at EFI) and Summar Rasras (Gender mobalizer at PWWSD) in front of the Palais des Nations, Geneva. 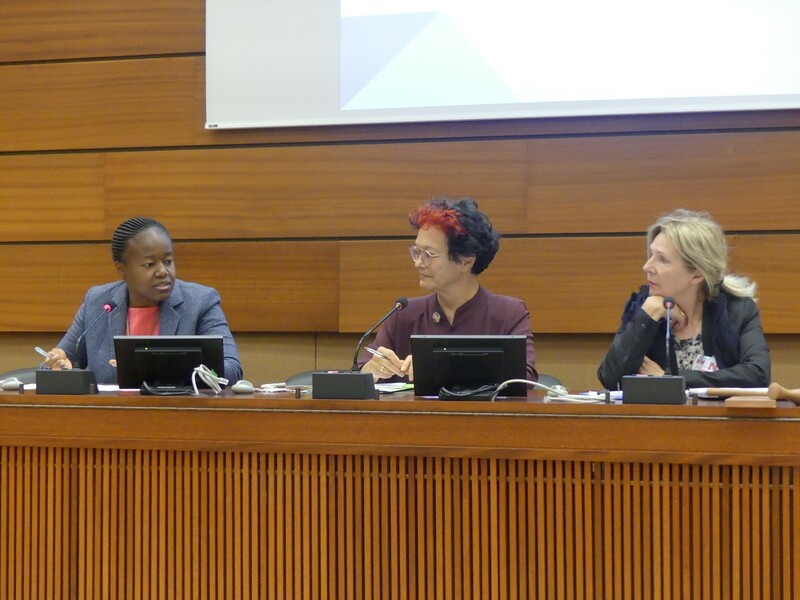 On the 24th of September 2018, EFI, PWWSD and Women’s UN Report Network (WUNRN) organised the side event “Women Rights Under Occupation” in Palais des Nations, Geneva. The panel welcomed Ms. Amal Khreishe, General Director of PWWSD, Ms. Antonia Mulvey, Executive Director of Legal Action Worldwide (LAW) and Ms. Lilian Halls-French, Co-President of EFI, and was moderated by Ms. Arielle Denis, Journalist and peace activist. The panellists focused on the violence faced by Palestinian women and girls who are rendered increasingly vulnerable and unprotected against the persistent violations of the occupation that breach IHL, IHRL, CEDAW, as well as other legal frameworks and international instruments. They reaffirmed that ending the culture of impunity and holding Israeli occupation accountable for its violations and crimes is paramount to safeguard Palestinian women’s security, health, autonomy and durable peace. Ms. Caroline Ouaffo Wafang from OHCHR (left) closing the side panel “Women Rights Under Occupation” with Ms. Lilian Halls-French (middle) and Ms. Arielle Denis (right). Ms. Caroline Ouaffo Wafang, Adviser on Women's Rights and Gender Section at the Office of the High Commissioner for Human Rights (OHCHR) closed this event on stressing the importance of a multistakeholders approach to prevent gender based violence and protect women.